The World’s Most Famous Arena is home to a team that hasn’t won a championship since 1973, but that doesn’t stop the masses from coming to New York Knickerbockers (Knicks) games. Madison Square Garden is the home to many things, one of which is New York City’s never-boring basketball team. Whether it’s referred to as MSG or the Garden, it has changed for the better in recent years with a $1.1 billion renovation. Seating and concessions have improved dramatically, making a Knicks game that much more entertaining. 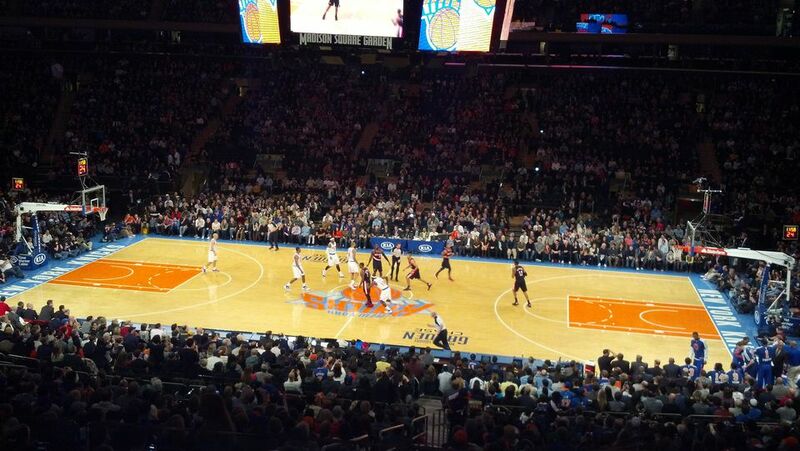 Despite how bad the Knicks have been in recent times, tickets generally aren’t available on the primary market. When tickets are available, you can buy them online at ​Ticketmaster, via the phone, or at the Madison Square Garden box office. You’ll have to hit the secondary market to get what you need most of the time. Obviously, you have the well-known options like ​​Stubhub and ​TicketsNow, Ticketmaster’s secondary ticket platform that season ticket holders are encouraged to sell through, or a ticket aggregator (a website that aggregates all of the secondary ticket sites except Stubhub) like ​SeatGeek and ​‎TiqIQ. As for where to sit when you go, basketball is a sport best seen in the lower level. One of the better options is the Club seats, located in the first eight rows of the three center section on each side of the floor. Not only do you get great seats for the action, but you get access to the Delta SKY360° Club which comes with all-inclusive food and non-alcoholic beverages and in-seat service. The newest addition is the Chase bridges, which offer a high view of the action from two bridges that go from one end of MSG to the other. The unique experience does come at a hefty price with seats generally being more expensive than the regular ones in the upper level. The bird’s-eye view allows you to see the game develop. If you can’t afford the fancy seats, sitting on the upper level is still a fun experience. Getting to Madison Square Garden is extremely easy since it’s located between 31st through 33rd street and 7th and 8th Avenues in Manhattan. Most people take public transportation because the Garden is conveniently located on top of a train station. Many subway lines run directly to or near the Garden with the 1/2/3 and A/C/E lines dropping you off right there and the B/D/F/M and N/R/Q lines stopping only one block away. Some may choose to take the bus to the M34 bus line running east and west on 34th street or the M7 and M20 running north and south on 7th and 8th Avenues. There’s also the Long Island Railroad and ​New Jersey Transit if you’re coming in from those respective areas outside the city. Trains run rather regularly to Penn Station from many towns, as Penn Station is the main hub where those train lines start and end in Manhattan. Of course, there’s always a taxi or a ride-share if you’re running late. Maybe you’ll even walk if it’s a nice day outside. Given that MSG is located in the heart of Manhattan, there are plenty of places to go for food and before the games. Those looking to grab a nice steak (or their famous mutton chop) stop off at Keens Steakhouse. You’ll find The Breslin a few blocks south of MSG, home to great gastropub food and the best lamb burger in the city. Right around the corner from that is some of the best seafood in New York City at The John Dory Oyster Bar. Those looking for pizza can travel a few blocks east to Marta, the new pizza house of famed NYC chef Danny Meyer. Finally, there’s some of the city’s barbecue at Brother Jimmy’s BBQ, where you’ll highly enjoy wings, nachos, and pulled pork before the game. There are also plenty of bars if you’re looking for a few drinks to loosen up before a game or celebrate after. Stout is the busiest of all the bars near the Garden and boasts two floors full of fans in Knicks colors. Next door at Feile is less hectic but offers a similar vibe. The Thirsty Fan is another place that doesn’t get too intense before games but is good to meet friends for a pregame drink. Local offers one of the few outdoor areas for drinks but gets crowded if the weather’s nice. Pennsylvania 6 offers a classier option to grab a cocktail or even take a seat to sample some of their gastropub food. Those looking for an upscale sports bar vibe head to The Ainsworth where flat-screen TVs are aplenty. Possibly the best part of the Garden’s 2013 renovation is the highly improved concessions. MSG brought in some of New York City’s greatest chefs and restaurants to help provide fans with a great culinary experience. There’s much debate with what the best item is, but one can’t argue with the size of the sandwich you’ll see at the Carnegie Deli stand. Your rye bread will be piled high with pastrami, corned beef, or turkey in what is probably the best value of the high-priced fare at the garden. A close second might be Italian Link Pizzaiola sausage at Andrew Carmellini’s Sausage Boss, with the smoked brisket sandwich from Hill Country a close third. There are also fine burgers designed by Drew Nieporent at Daily burger, where you’ll be sure to enjoy the bacon jam. Jean-Georges Vongerichten’s sandwich at Simply Chicken may be too simple to impress you with the other options out there. Jean-Georges also does tacos at Cocina Tacos and while they taste good, you'll feel like you need more for your money. Aquagrill is a seafood restaurant familiar to New Yorkers, and the lobster and shrimp roll offered at the garden is one of the pricier options. The individual pie at Pizzeria Dell'Orto may leave a little to be desired, so it’s surprising the Garden didn’t sign up a more well-known pizza option. Thankfully, the chicken fingers and fries without a famous chef backing it up are a popular item that delivers and you can never go wrong with frozen yogurt from 16 Handles to finish off your eating. Hotel rooms in New York are as expensive as any city in the world, so don't expect to catch a break on pricing. They’re pretty expensive in the Fall, but prices ease up in the Winter before getting slightly more expensive in the Spring. There are numerous brand-name hotels in and around Times Square, but you might be best served not staying in such a highly-trafficked location. You're not that bad off as long as you're within a subway ride that takes you near Penn Station.‎ Hipmunk can help you find the best hotel for your needs. Alternatively, you can look into renting an apartment via AirBNB, HomeAway, or VRBO. People in Manhattan always travel so apartment availability should be reasonable at any time of the year.